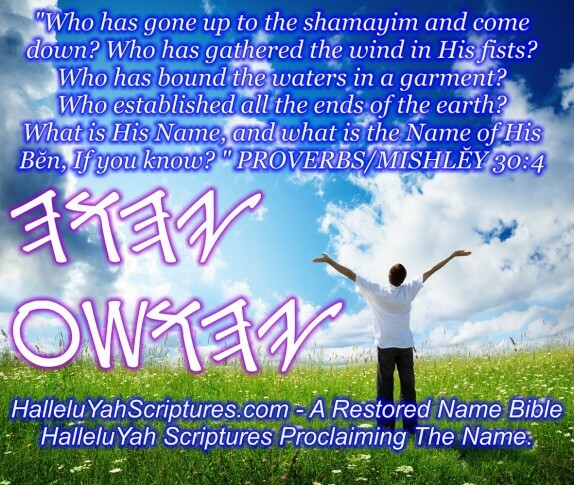 Shalom & HalleluYah from Israel. Part of the HalleluYah Scriptures team are in Israel on a missions trip to reach out to His people. This trip has been prepared for a number of months with support from those who support the HalleluYah Scriptures project. It is an important and urgent trip to seek believers who can help in reaching out to those who are in need of free material. 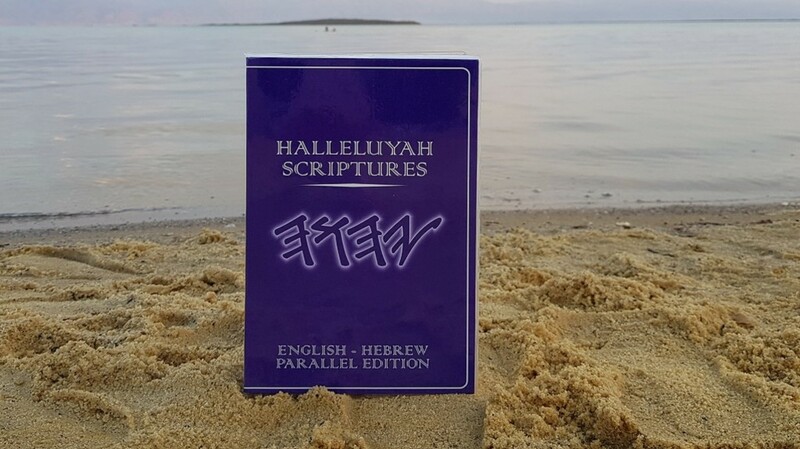 This is why the translation team worked on the Parallel Hebrew/English edition as it is important to have His Word in the Hebrew language for the Jewish people who come to Truth and for those who would love to learn Hebrew. It is the only Restored Name edition that has all 66 Books in Hebrew. 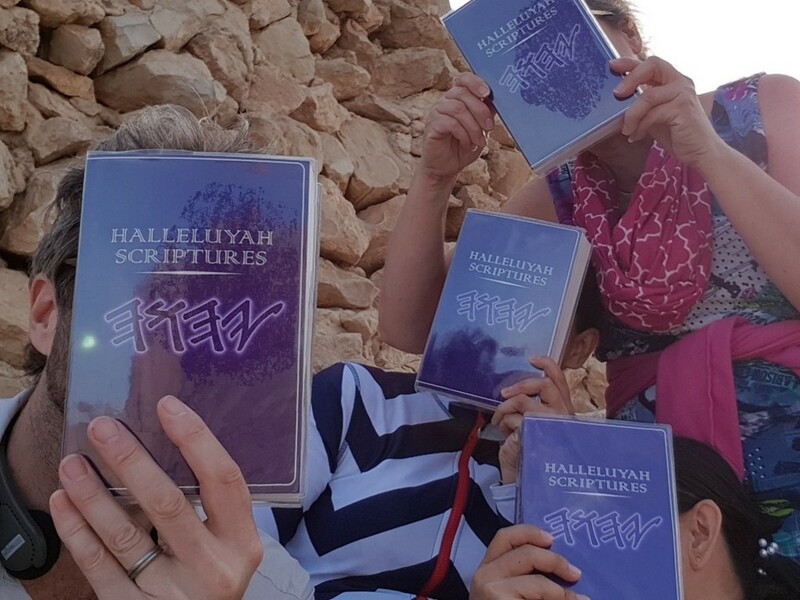 HalleluYah, the top picture is two of the four team members in Israel and have been working on the project for the past 5 years - two sisters that are very passionate and dedicated to His Word - the HalleluYah Scriptures. They have been reaching out to His people with the T-Shirts' messages and sharing material that proclaim His Truth on the streets. 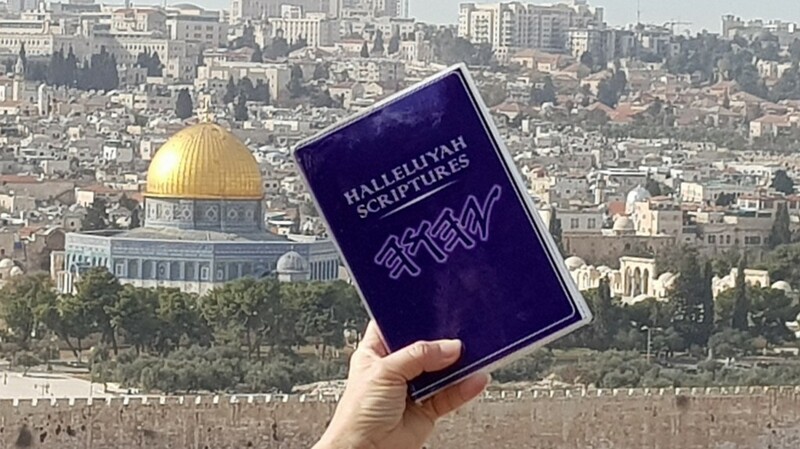 There has been a number of opportunities to share the HalleluYah Scriptures with people who have come to visit Israel and it has been amazing how YHWH has ordained each meeting. 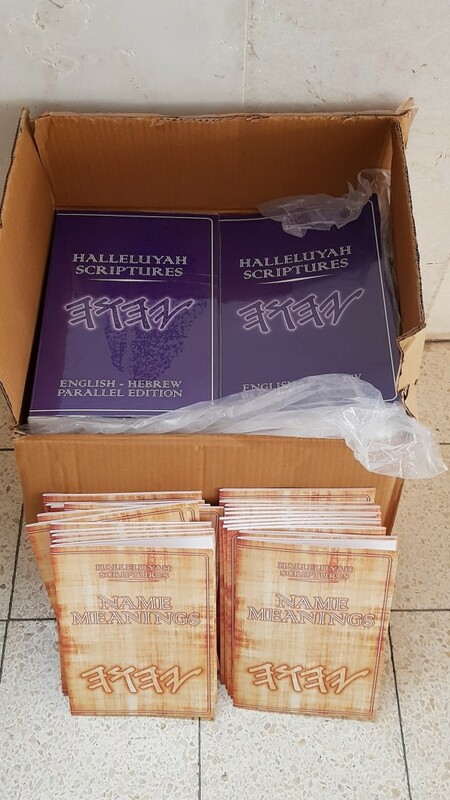 HalleluYah for orders like this going out to believers who will be sharing them with those in their group or on their travels around Israel. 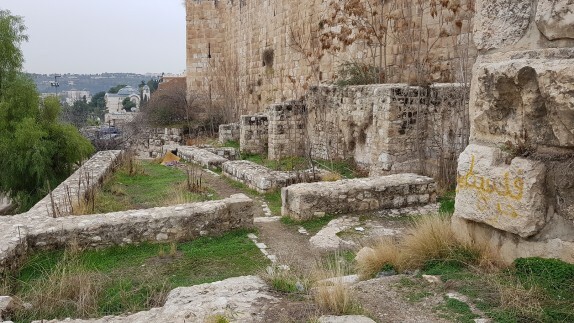 The team has been able to connect with a number of people throughout Israel to proclaim and share this wonderful project. Those that have connected with the team express how excited they are about this project and they agree how important it is to get as many copies out around the world to His people. 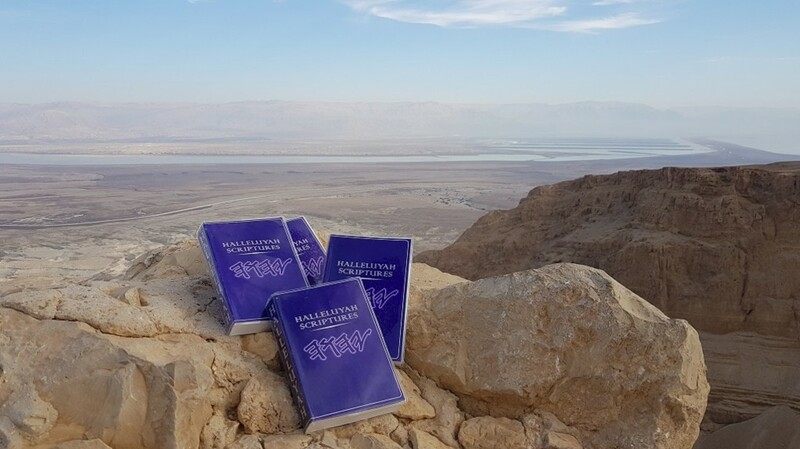 All those that were contacted had never seen a Restored Names Bible with the English and Hebrew and they were as excited as we were when given the vision to complete this special edition for the Jewish people. HalleluYah, another order that was delivered to a family who will be sharing them with those on their travels. They were excited to be able to have free copies to share with each Jewish family that know the Messiah and/or are new to Truth. The team expressed that Israel is in a lot of confusion with so many groups and religions coming in preaching so many different doctrines that the Jewish people and many that live here are so confused. Their faces are very sad and they really need to know the real Mashiach, for there are many who donate to this country through big organizations, but those on the lower scales are suffering. It is very sad to see. 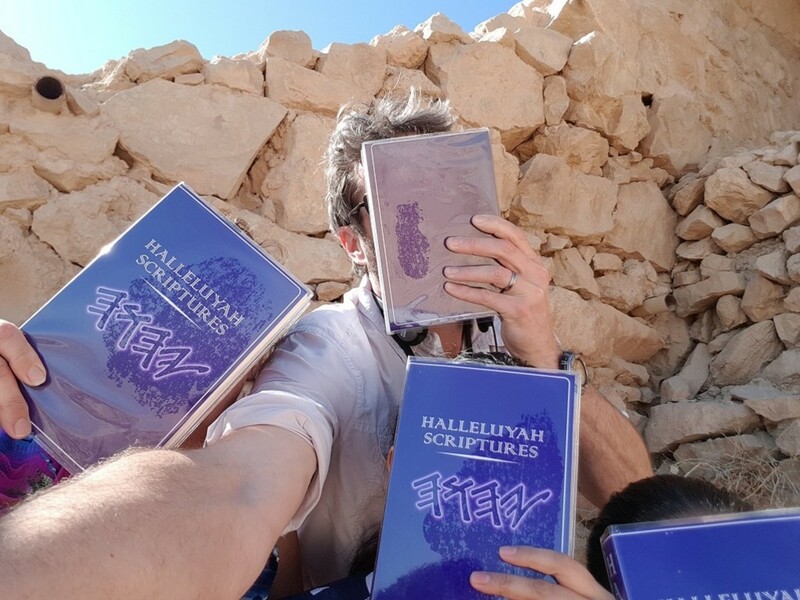 Even before the HalleluYah Scriptures team left for Israel we received many emails of caution that the interest in His Word - HalleluYah Scriptures would be minimal if not completely rejected, yet the prompting by the Ruach was undeniable and the support for this outreach was swift and strong. As we have shared, we had prayed about this for a period of time before asking for help and that help came within hours, so we knew YHWH wanted us to go to Israel. We could not be like Yonah and turn our backs on the call to take His Word to Israel for those who are seeking. Even though we had received a number of emails to not go, we had to go after we had prayed for a specific number of things to fall into place for a green light and those things fell into place very fast, HalleluYah. 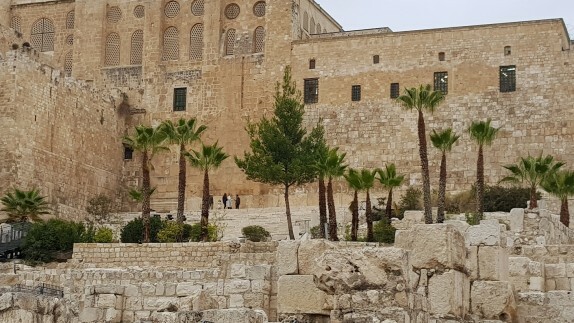 Indeed, the people living in Israel are a stubborn collection of religions all wanting a slice of the 'Holy Land' yet there are pockets of true believers and people who are seeking the real Truth who are, and have been praying diligently, working in their respective areas to bring Truth amidst so much confusion. Many organizations are receiving huge amounts of money yet are teaching a very compromised or watered down Truth which has also brought much confusion to the residents of Israel and the Jewish people. What a berakah it was to be able to contact and support those who are walking in Truth and wanting to reach others. It was very special to be able to share about this very important and urgent project. Many who we had made contact with had been praying for a Restored Names Bible and having it in Hebrew as well made a huge difference. They were amazed that they were free to those in Israel and also free to those who cannot afford or have no options of affording, they understood this principle very clearly as most of our supporters do as it is Scripture. The HalleluYah Scriptures Team traveled from the top of Israel to the bottom of Israel contacting every possible group or individual to bring awareness of this special project and while not all immediately grasped the same vision as we have, there were a number who did and some who took stock for further study which is a sensible option in a number of ways, because this country is constantly bombarded with materials from religious zealots of all denominations, adding to the confusion! 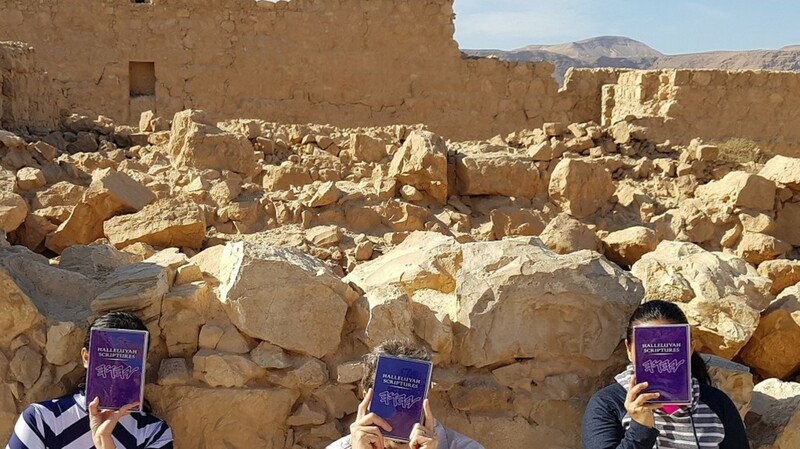 When the team had exhausted all contacts, they hit the streets offering free Messianic Bibles and even going to the extent of interrupting Christian tour groups to simply introduce the Name of YHWH and His Son. Many were very interested in hearing about this special edition and asked many questions which led to sharing about His Laws and Festivals etc. It seems that they were so hungry for Truth and were in awe of this new information, as it was new to them having not heard about this information before in their lives. 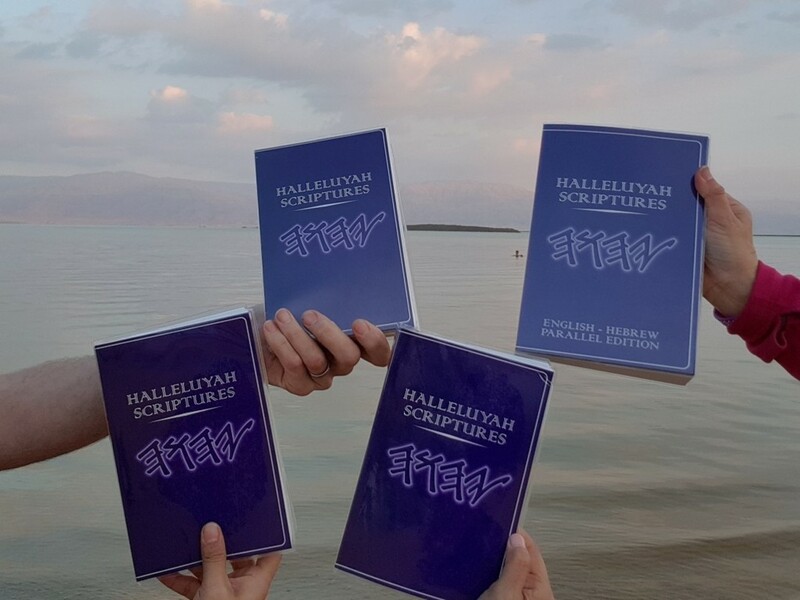 These methods of reaching out to Christians and those seeking Truth on the streets brought varying results, but also some miraculous encounters; for example, a small group waiting for a boat on the Sea of Galilee was introduced to the Names and among them was a trio who were very taken with the Truth shared and immediately requested copies of the HalleluYah Scriptures to take with them to Madagascar of all places! A small island off the coast of Africa. The team were led to go to the Sea of Galilee that very day and it really amazed them that YHWH would have 3 people book their ticket to go to Israel and that they would take a tour to that area on that same day at that time to be greeted by the team who felt led to share this Truth to them. It was amazing! All praise, honor and esteem to the Most High who organizes all appointments. HalleluYah!!! The team went into the old city many times to share His Truth They also walked with a local brother and sister around the outside wall who shared many things, and were reminded that just as the true Jerusalem is buried under many layers of succeeding rulers and kingdoms, so the Truth is buried under many layers of false religions and imposters. It is our job as archaeologists of Truth to excavate and expose the false and reveal the Truth. It seems YHWH was teaching and sharing with the team about the state of this country yet sadly, many in the world are fed lies about Israel. Nearly every part of Israel was covered either by visiting a group or organization or walking the streets sharing the Truth. 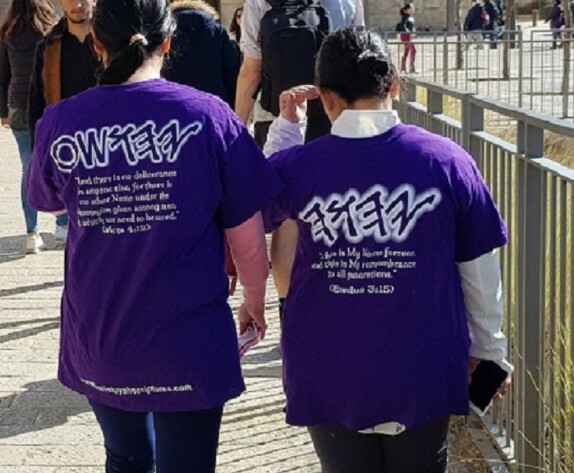 They were walking through the Old City and met a young gentleman from California who was amazed to see the HalleluYah Scriptures T-Shirts and said, "Wow I really like those shirts." This was because the Names were on them with Scripture. Many took photographs of the T-Shirts and received information handed out. The team were led to go and share in the middle of the Old City where they encountered a group before them and having approached, two gentlemen asked where they were from, to which they replied, the Philippines. One of the gentlemen was a very well known and famous TV sports anchorman who was so excited to receive HalleluYah Scriptures, for He used the Names but had never seen a Restored Names Scriptures. On another occasion the Ruach led the team to reach out to a Chinese family who never knew the Names and were so excited to hear this Truth. To think they had come all the way from China to receive this amazing message, HalleluYah! Also another group came along from Africa and were also very open to hearing about the Names. There were also 3 Filipinos who were approached and the team shared about the HalleluYah Scriptures project who were also very excited about this mission. The T-Shirts were very powerful in proclaiming the Names that people came up to the team to listen to this exciting and amazing Truth in His Word. 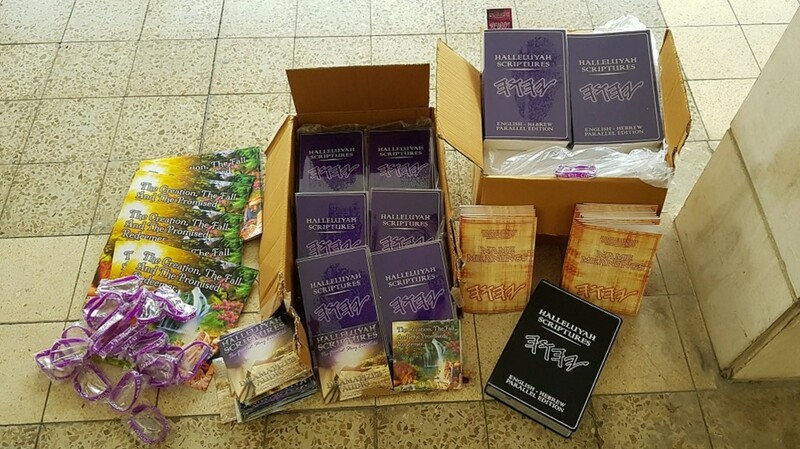 The team were able to give away thousands of tracts and cards of hope to many people all over Israel. One of the amazing trips they took was to Masada... All the way to this remote place, up this very steep mountain was a lady from the Philippines who had her life changed forever when the team were able to pick her out and share the Names. She was gob-smacked and shocked to the core as she had never heard the Names before in her life, and could scarcely believe it. Her life was changed forever on that very day. There was a lot of material shared that day in that place. HalleluYah, we were able to meet a good number of brothers, sisters and families on this trip who were so touched by the HalleluYah Scriptures. The team felt led by the Ruach, as they shared how YHWH has been so compassionate and long-suffering over this country. HalleluYah for this brother below who was so excited to have many copies of the HalleluYah Scriptures. 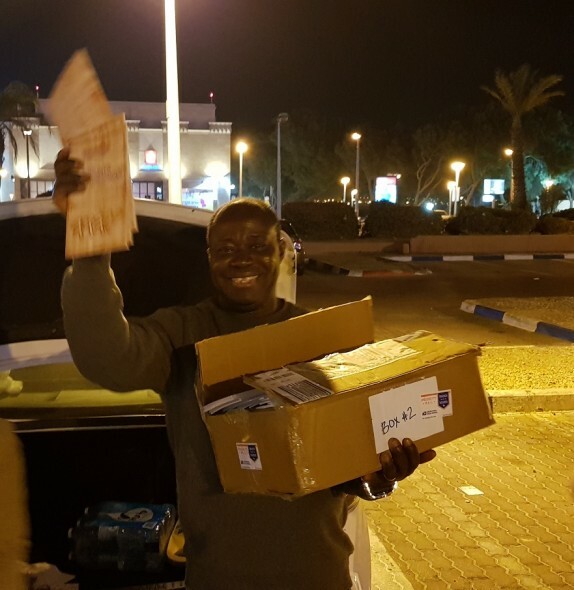 He has been working, proclaiming the Truth in Eilat, Israel for 23 years but works with large groups in Ghana who were so excited to hear about this amazing project. We will be shipping a large shipment to Ghana for all the needs in that country through this brother below. It was another amazing contact that will change lives forever. The team travelled through Be'ersheva on the way to Eilat, and were able to share the Names and Truth on the streets. Eilat was an eye-opener, where so much happened in this part of Israel, the team decided split up... One wearing the HalleluYah Scriptures T-Shirt took a sign that mentioned the Restored Name Scriptures and a some came up to this brother asking about the HalleluYah Scriptures and others took a free copy and others ordering on the HalleluYah Scriptures website. 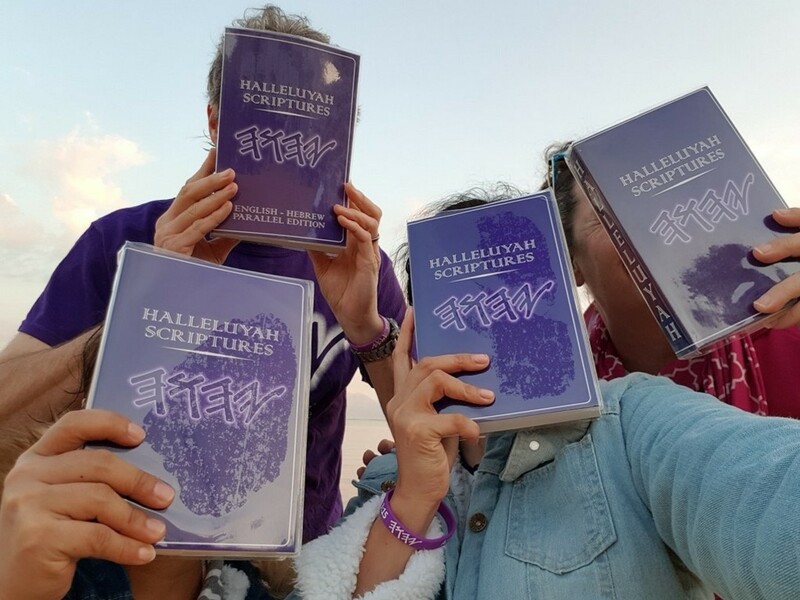 They had never seen the HalleluYah Scriptures and were very touched by the free copies. A couple from Sweden, also Norway and even the Netherlands too were very excited about the project and were very touched by the free copies offered. They said they would take them back to share with their group. 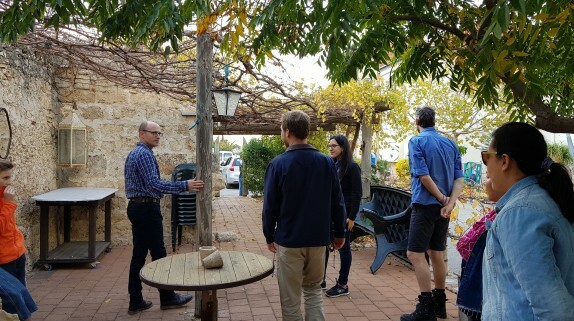 The team were invited to a Kibbutz in the north-west of Israel where they were given a wonderful meal with all the produce coming from the land. 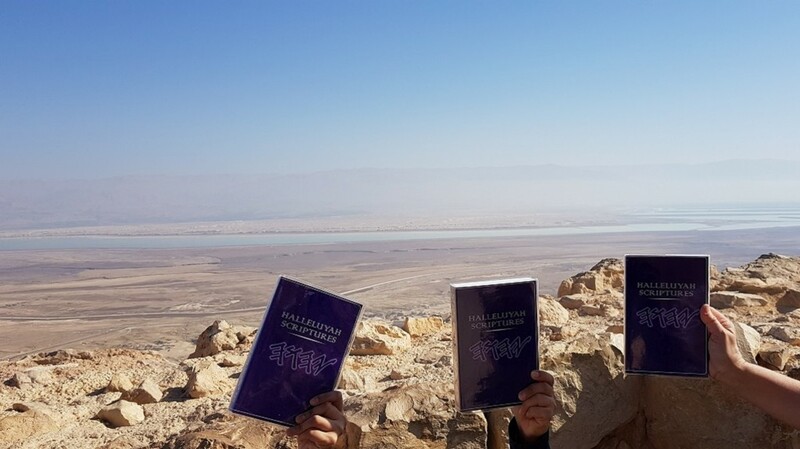 The family that gave them the meal also gave them a tour and at the end of the tour the team presented a Hebrew/English edition. The brother was so amazed, as he had been praying for such a Bible for a quite some time. He was so very grateful and thankful for this wonderful gift. We want to say a very special thank you to all those that donated and supported this wonderful and very urgent and important trip to Israel. It was a trip that needed to be done as many lives were touched and curiously, a large percentage of them were people who do not live in Israel, but arrived on the right day and time to have their lives changed. The team mentioned that it could be a full-time work in this country, as those coming in are so hungry, yet not receiving the Truth, but a watered down version which leads to much confusion. 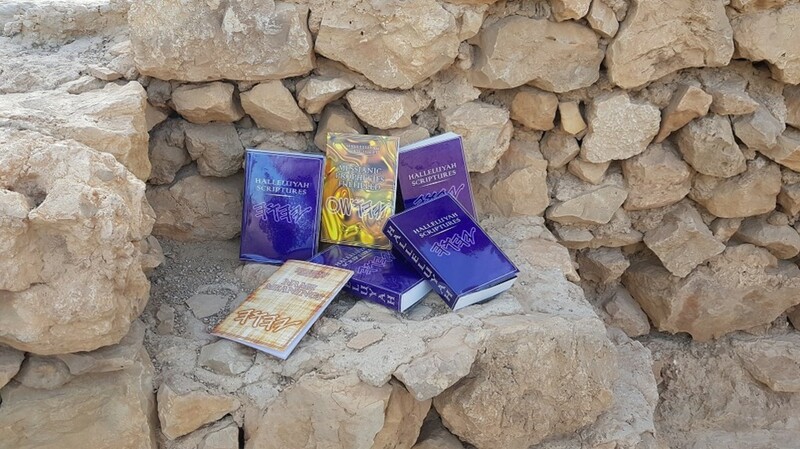 We thank you for supporting this special trip with your donations and prayer and it has made a huge difference for His people and as recipients look deeper into this many orders will come in for free copies. 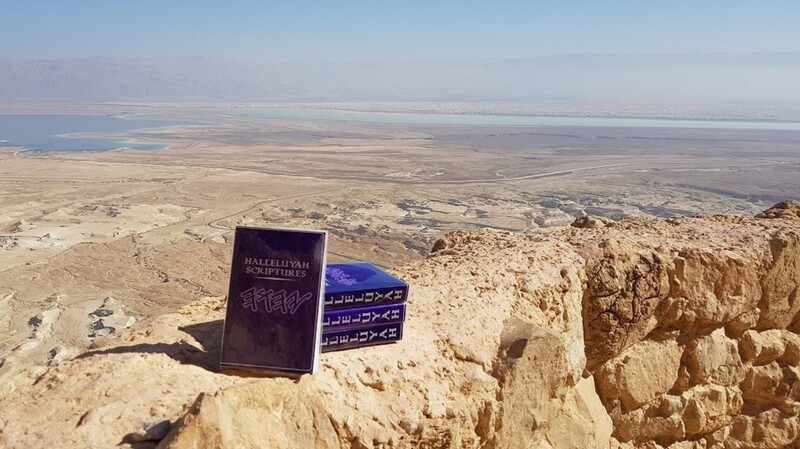 We were able to give out quite a few free copies and still have stock in Israel for future orders.